Want to smash your players to smithereens with a giant steal fist? Want to wreck havoc, throw cars, and scatter the women and children? 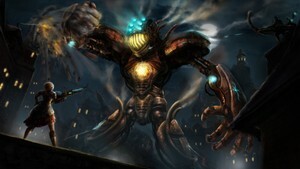 Then the "Giant Steampunk Robot" SoundSet is for you! Feel the earth shake and hear the grinding of gears as this enormous automaton goes to work on civilisation. Vehicles wizz pass, period weapons burst and the crowds scream and panic! Sounds like a perfect afternoon!